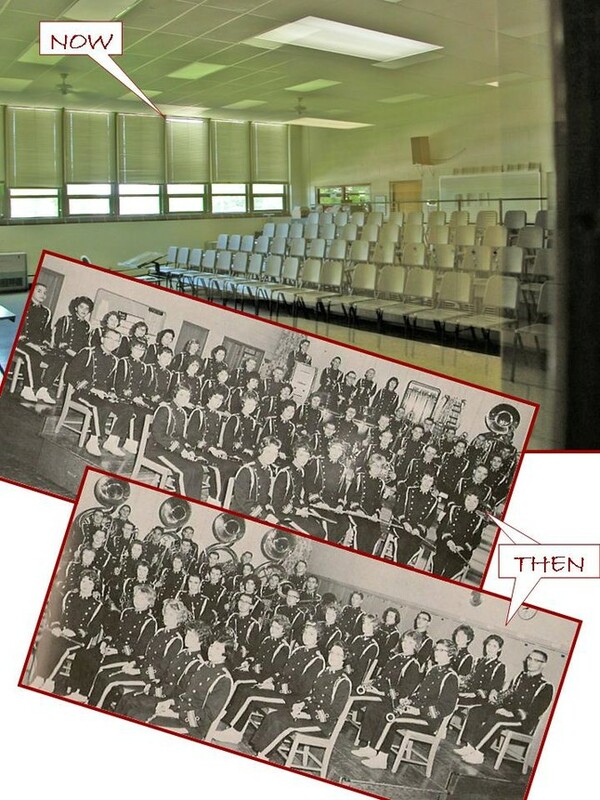 Take a Tour of Moline High School ... fifty years later! Keep scrolling! 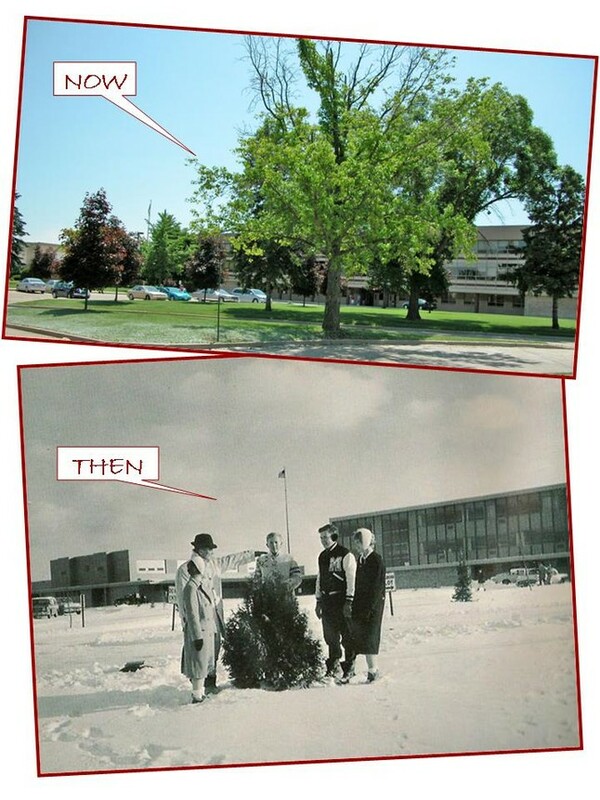 When we were students, the building we knew as Moline High School had just opened in the fall of 1958. 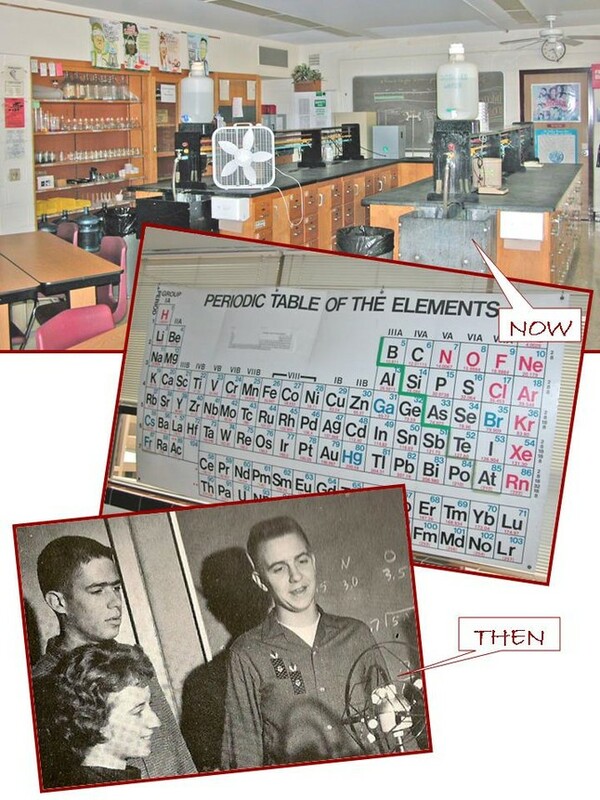 We entered as sophomores in the fall of 1959 and graduated two years, ten months later in June 1962. There were three classes at a time at the high school. Now the building houses four classes, freshmen through seniors, and is considered old, even though she has had a facelift. George Senneff, who coached Moline basketball from 1920 through 1940 and 1944-45, was coaching. 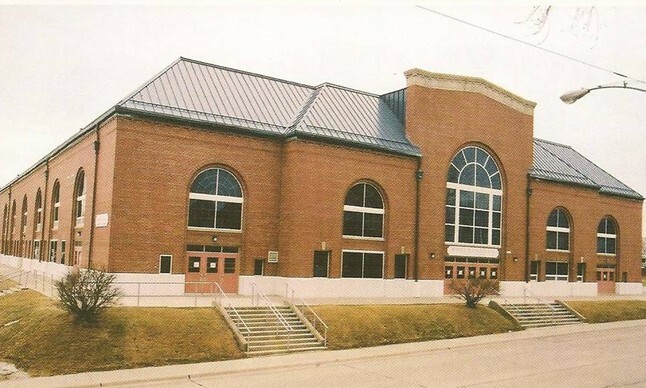 At that time the field house was called "Moline Field House." It was dedicated in 1940 as "Wharton Field House" to honor T. F. Wharton, the director of the bond drive that enabled the field house to be built. That game was the first of a "double header". The University of Iowa played Marquette University in the nightcap. That Moline team (1928-29) went on to a 14 and 9 season, losing to Freeport in the Sectional State Tournament. Both men and women's basketball teams now call Wharton Field House "home". It has been completely renovated, but you'd still recognize the outside, although it has a new roof, doors, and it has been tuck pointed. Looks great. Inside ... well, there are quite a few changes. The court is new and is no longer "elevated" so there is no need for the guard around the court. The fan seats have been improved. But the biggest change is the scoreboard. The large center scoreboard hanging from the rafters is gone! But the new scoreboard provides a lot more information than the old one. If you get a chance, go to a game and see the improvements. 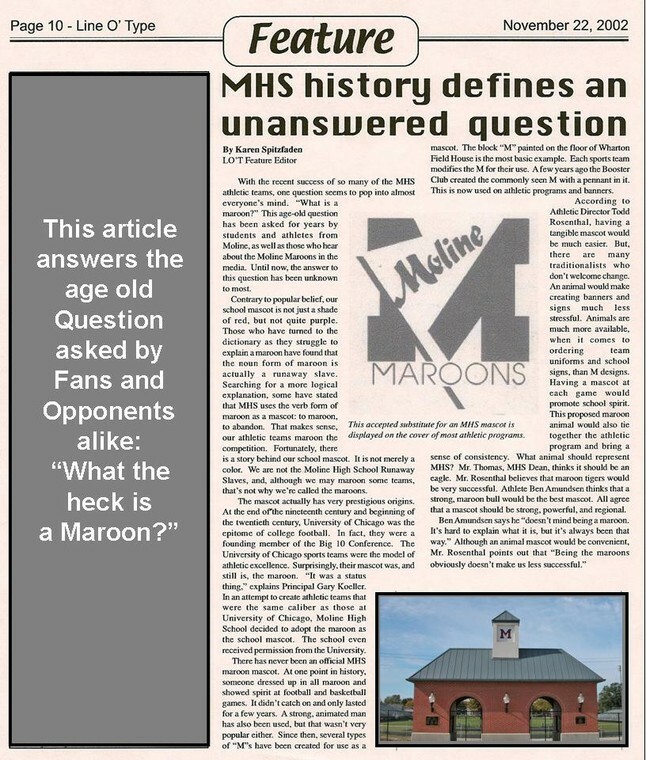 What the heck is a Maroon?!!? That was what our athletic teams were called. 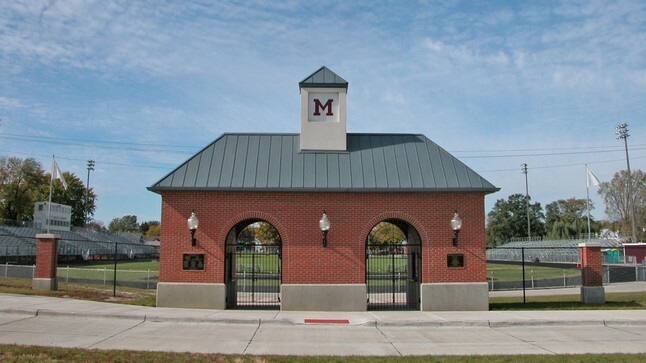 Moline's teams are still called the Moline Maroons. Why? This article may shed some light on why we had, and still have, such an unusual nickname. The article appeared in the 22 November 2002 Line O' Type. 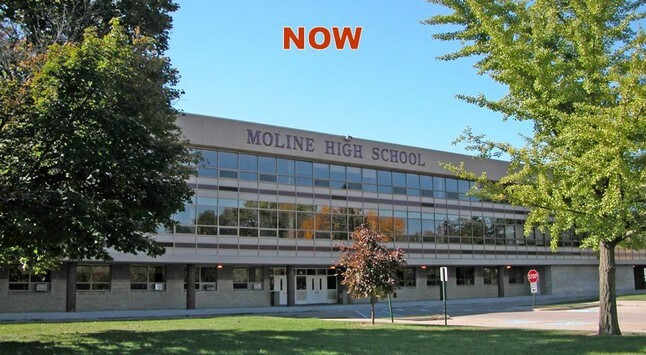 In May of 2009 Moline High School held an Open House. 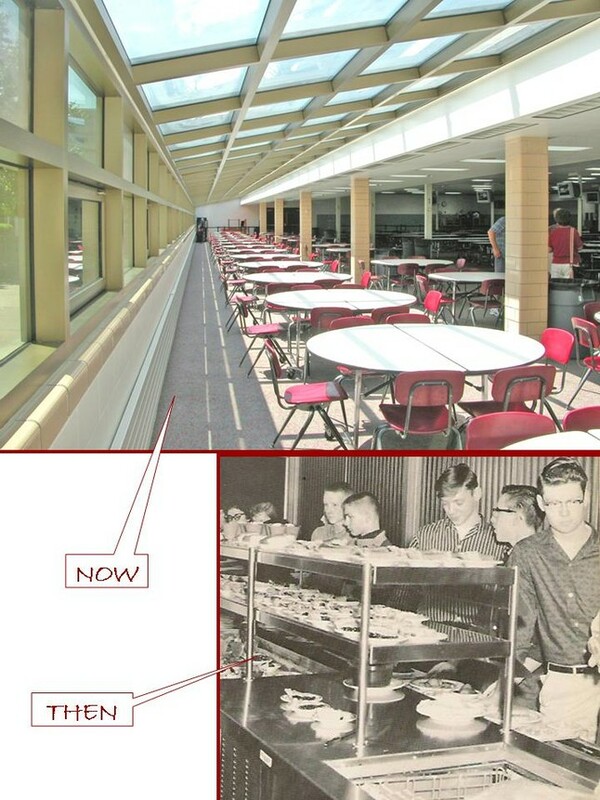 They opened the doors one Saturday morning and invited the public to see what the fifty year old building looked like. Perfect for our web site! So Sylvia and I took the tour. We ran into two classmates, Barb Masengarb (Cline) and Susan Wiedenhoeft (DeGrande). I took some pictures and then tried to compare them to shots that were in our yearbooks so you can see what has changed and what is still the same. 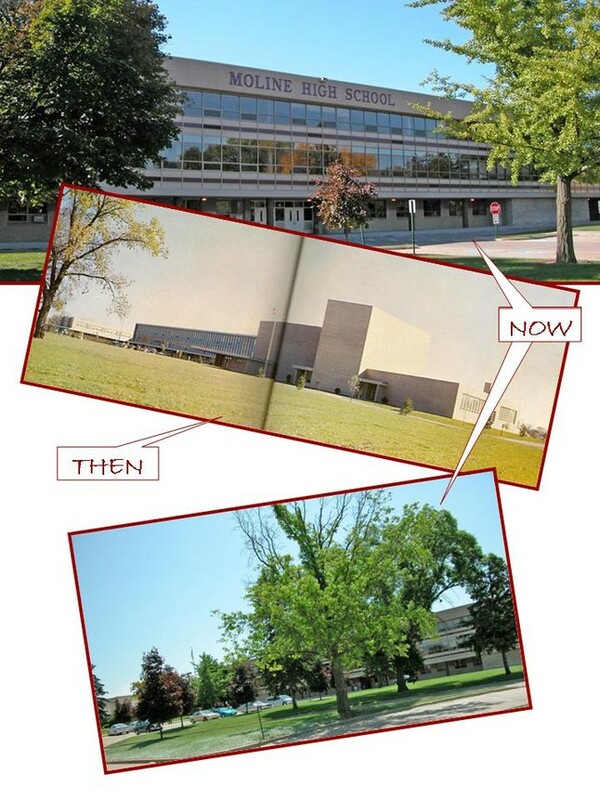 The first thing that you would notice if you hadn't been to MHS since graduation would be the physical appearance of the building and the trees on the grounds. 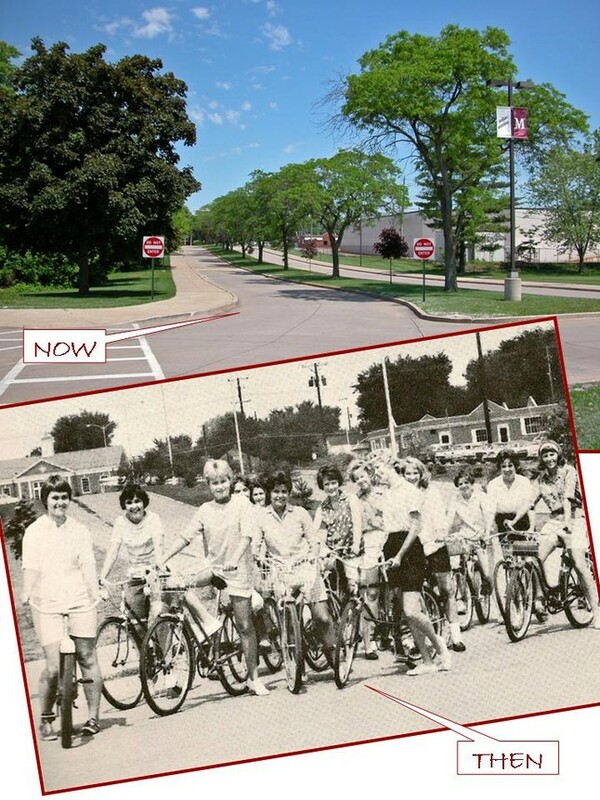 You may recognize some of the girls from the class of 1962 who were ahead of their time riding bicycles to school for senior registration. That scene up entry drive has been changed by the growth of trees, as well. Do you remember our beloved "M" in the middle of the first floor? Chuck Hoffman was supervising a detail for cleaning it back in 1962. Well, the floor didn't last and with it went our "M". This is a picture of the third "M" they've had and you'll notice that it is roped off to prevent people from stepping on it. Didn't need that in our day. We knew we'd be in trouble if we stepped on it and most of us kept off of it out of respect for good ol' MHS. Then we checked out a couple of classrooms. Remember when we used slide rules to calculate everything? 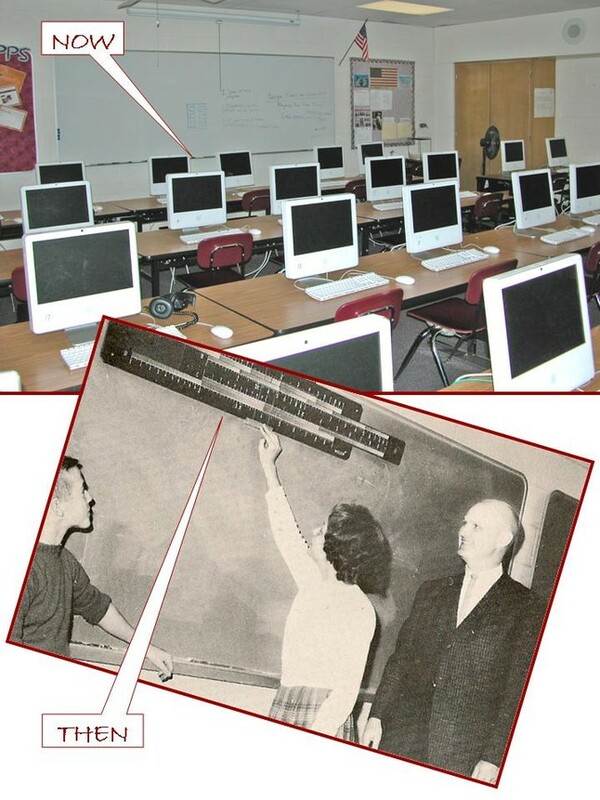 Well, I couldn't find one slide rule in a classroom, not even in ancient history. But they have plenty of computers. We had to check out a chemistry laboratory. As best as we can tell, this is the room where Sylvia and I first met. I could have sworn they've added a few elements to the Periodic Table since Miss Hulse taught in this room. Then we checked out the library. Now it's the resource center or something like that. Still looks like a library, though. 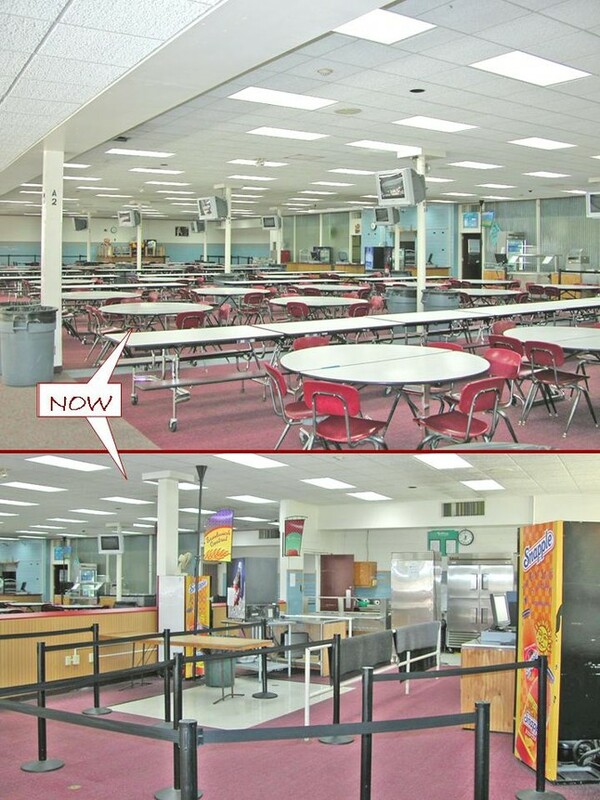 The reason I could tell is that the tables and chairs were still the same! Really! They must have picked out some sturdy ones back when they bought those. 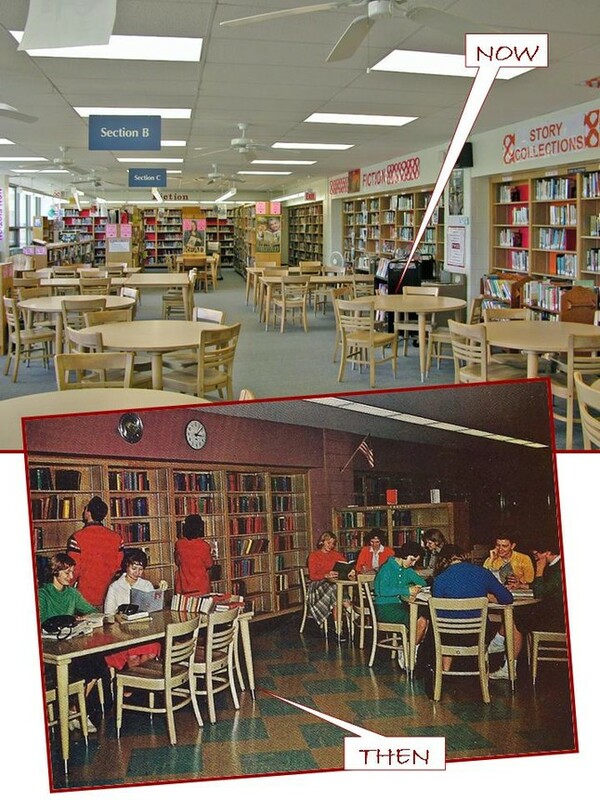 Look at the picture of the library from 2009 (top) and from 1962 (bottom) and you'll see the same tables and chairs. Then we went to the cafeteria. 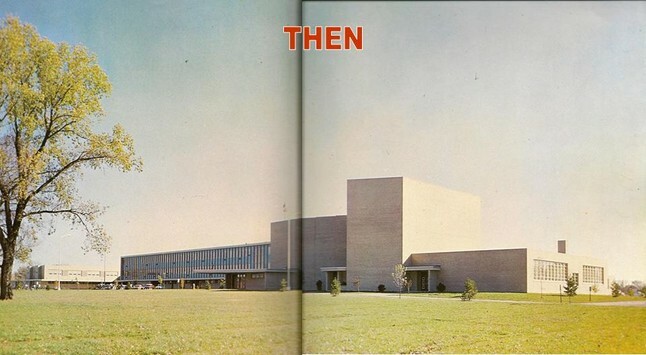 This is the most changed part of the building, except for the fact that a whole new wing was added in the late 1960's. But it is a beautiful cafeteria with an atrium and patio for outside dining and visiting during lunch hour. Then on to the "gym" wing where we participated in PE classes and sports. 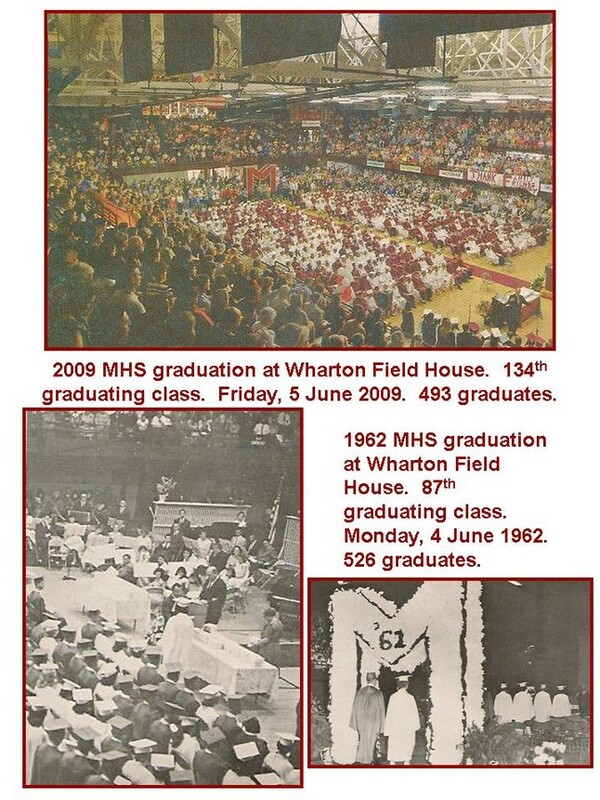 Since MHS has Wharton Field House, we had a smaller gymnasium attached to the school than most schools. 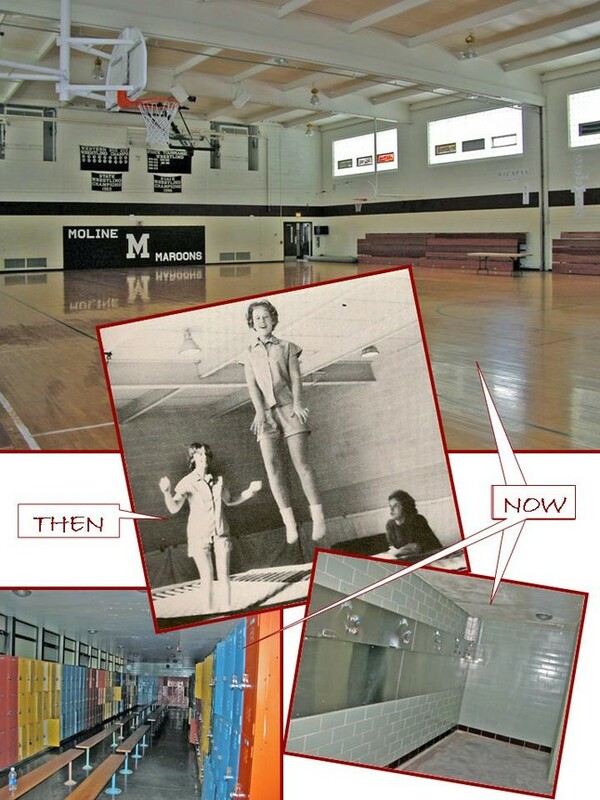 (An additional gymnasium was included in the new wing to provide more room for PE and sports, still important features of a Moline public school education.) That's Sylvia in the gym bouncing on a trampoline. She now has a granddaughter who likes to do the same thing! The locker rooms and showers have been upgraded. 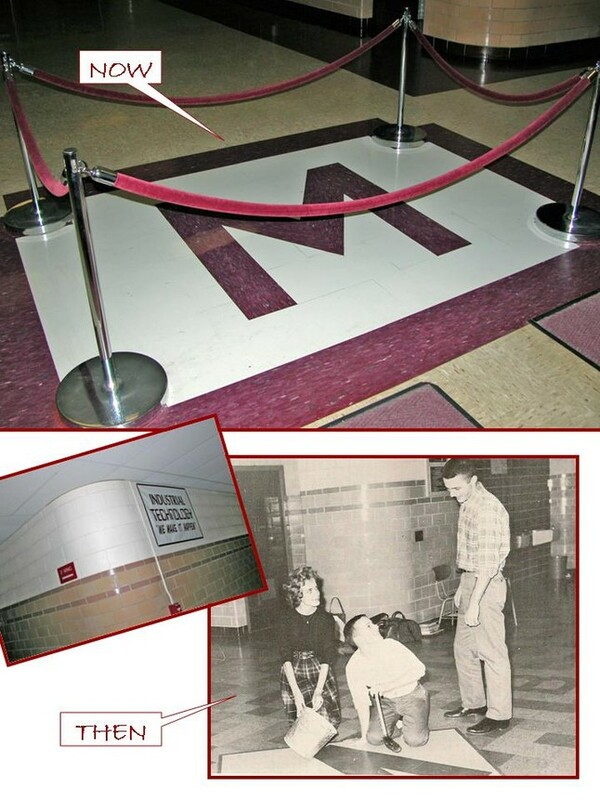 It is obvious that the Class of 1962 left its mark on MHS. 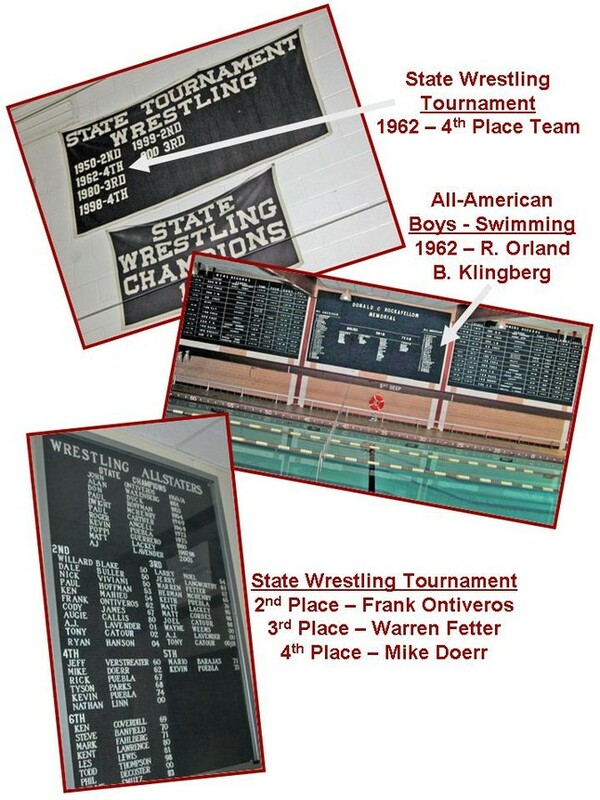 Still hanging in the halls and walls of MHS are banners and signs listing State Wrestling accomplishments and All-American Swimmers which have 1962 graduates listed. 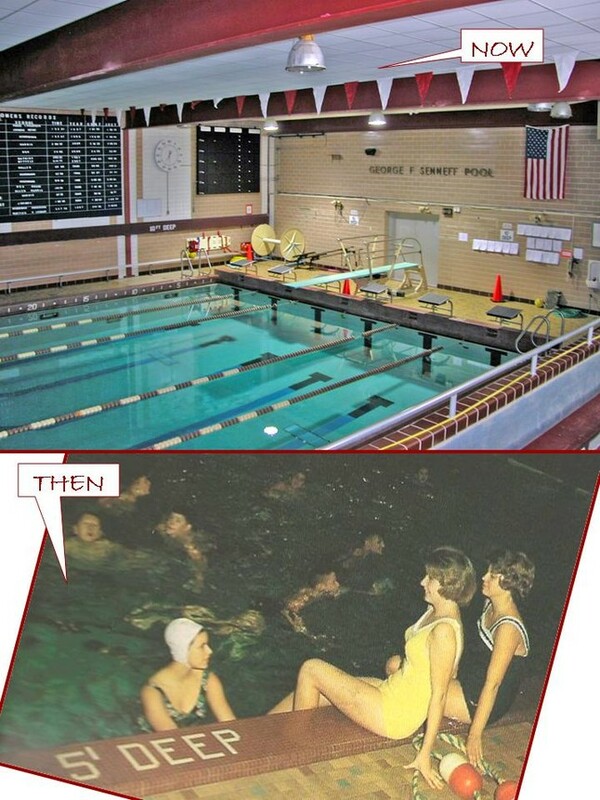 And that brand new pool still looks great, although it would have been hard to top the scene from our 1962 yearbook that I've insterted for comparison purposes only! The varsity locker room has been changed quite a bit. All varsity sports, except basketball, used this locker room. The day we toured, the MHS baseball team was packing up to play in the state tournament. 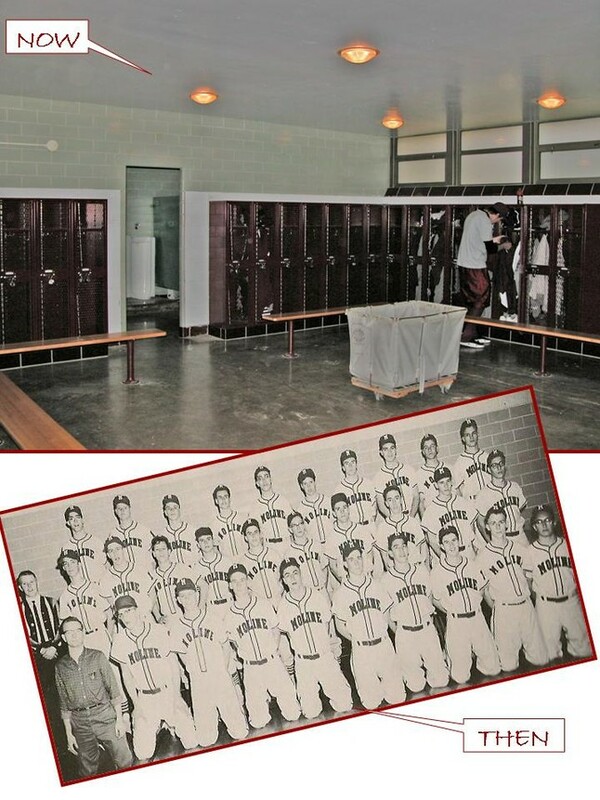 They use the same room the 1962 varsity baseball team used nearly fifty years ago. Lot's of memories in that room. 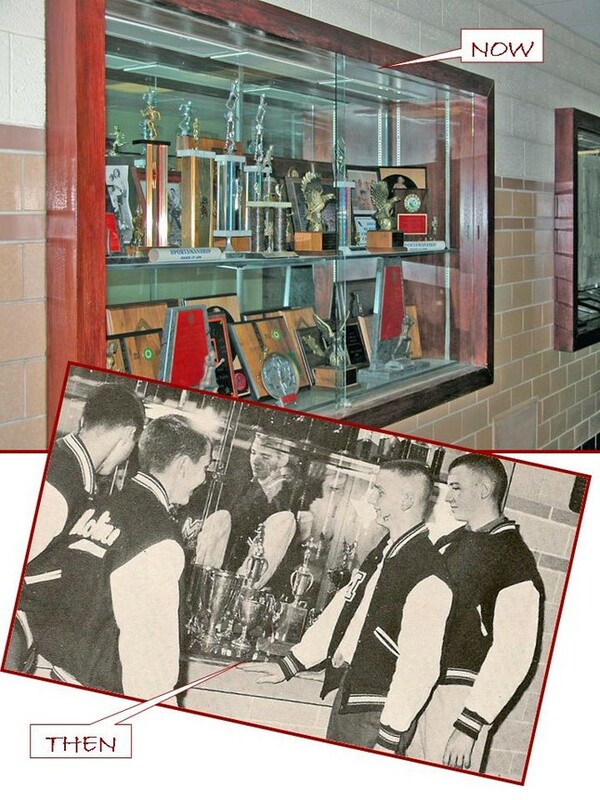 The trophy cases still hold the signs of successful athletic endevours. Girls sports trophies are in abundance. But it was difficult to find any from our era. They must be stored away some place special! 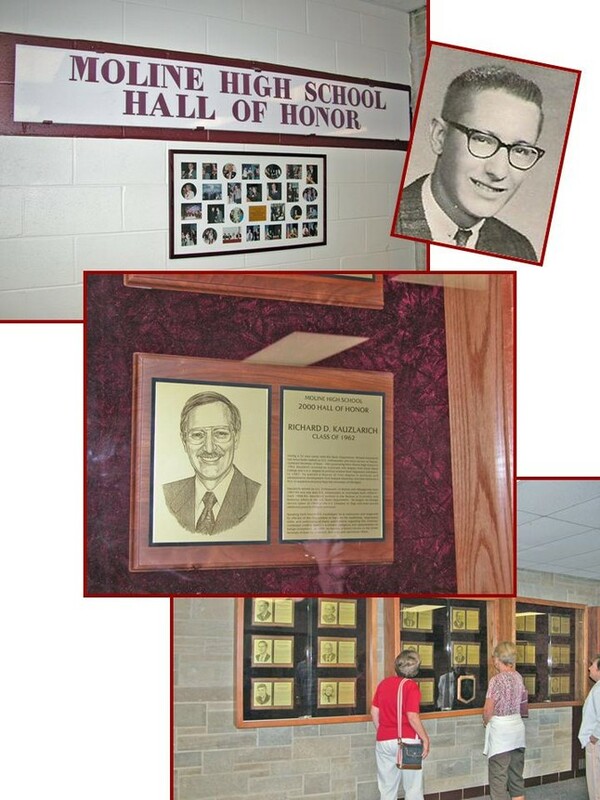 Two people from our era are honored in the hallways of Moline High School: John Anders and Rich Kauzlarich. Even though John was not a member of our class but of the Class of 1961, we remember him. He passed away at a much too young age while practicing football at University of New Mexico in Albuquerque, NM. 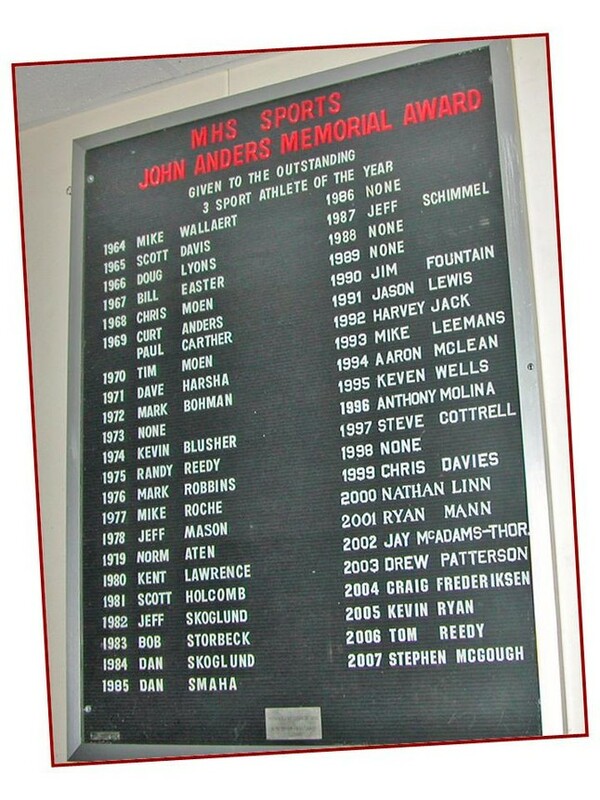 The "John Anders Award" is given to the outstanding three sport athlete of the year each year by Moline High School to honor John's high school athletic accomplishments. The first receipiant of the award was Mike Wallaert, brother of our classmate, Mary Wallaert (Wall). Rich Kauzlarich is a member of the Class of 1962 and lives in Virginia. Moline High School has recognized his career accomplishments having served his country in the Department of State very effectively for many years culminating in his assignments as US Ambassador to Bosnia-Herzegovina and as US Ambassador to Azerbaijan. 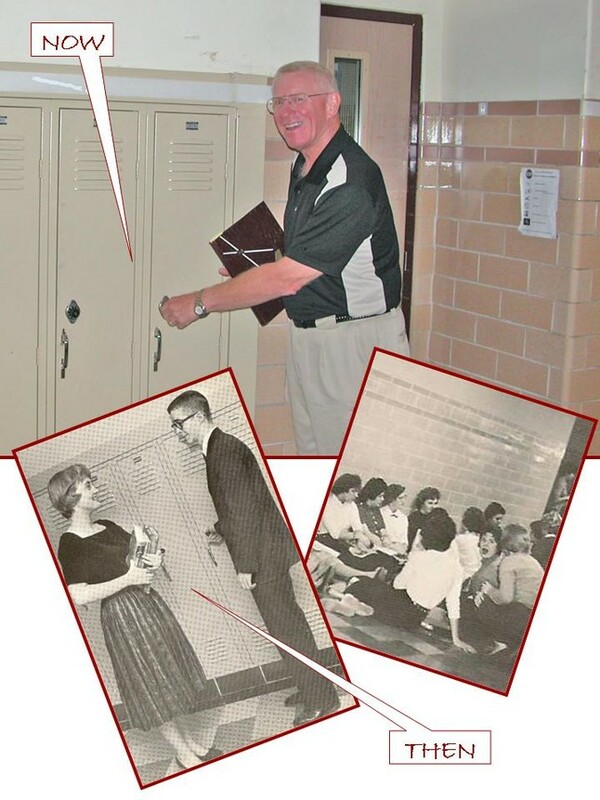 Rich was an original inductee to the Moline High School Hall of Honor. After Barb Masengarb (Cline) and Sylvia checked out the other people who are in the MHS Hall of Honor, I went down to the band room. Wow! Had it changed. Hard to imagine that all those band members got themselves and their instruments in there. The old risers are gone. We then saw the auditorium. 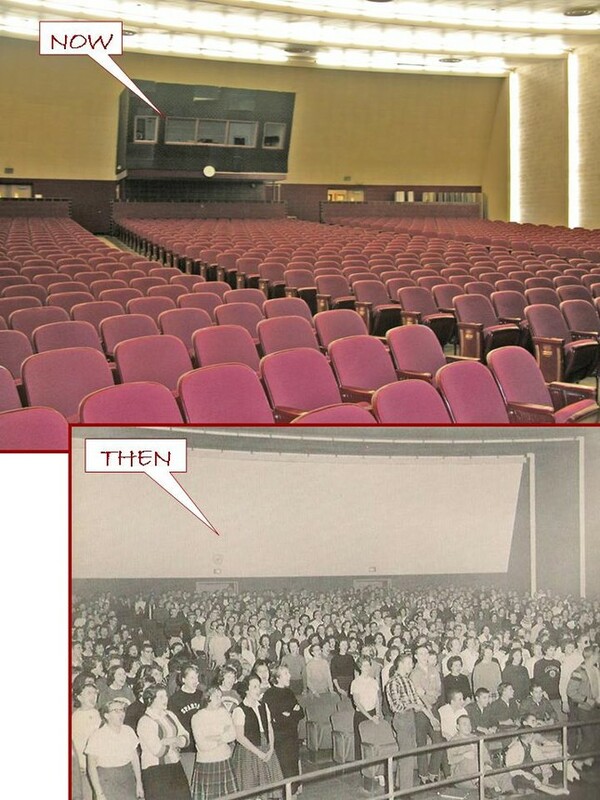 Still looked the same as when we were there, except for a new sound system station at the back. 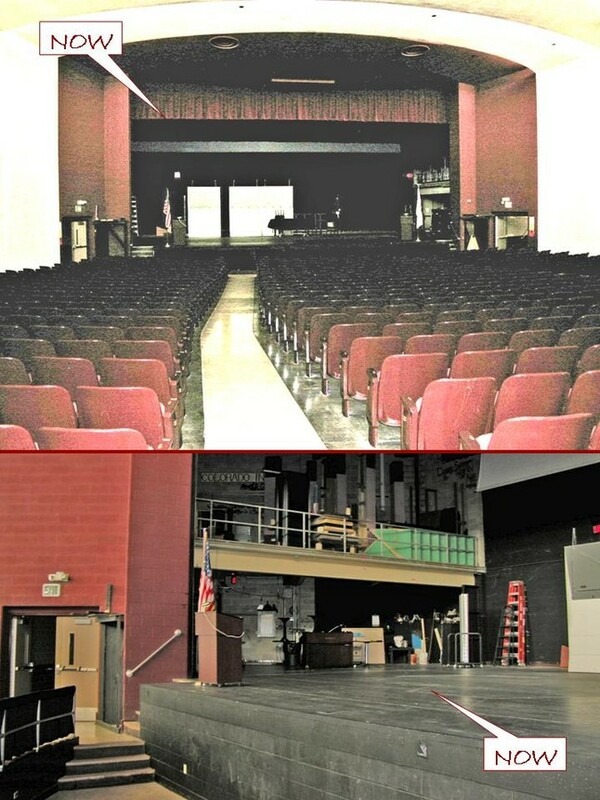 Man, a lot of things took place in that auditorium. 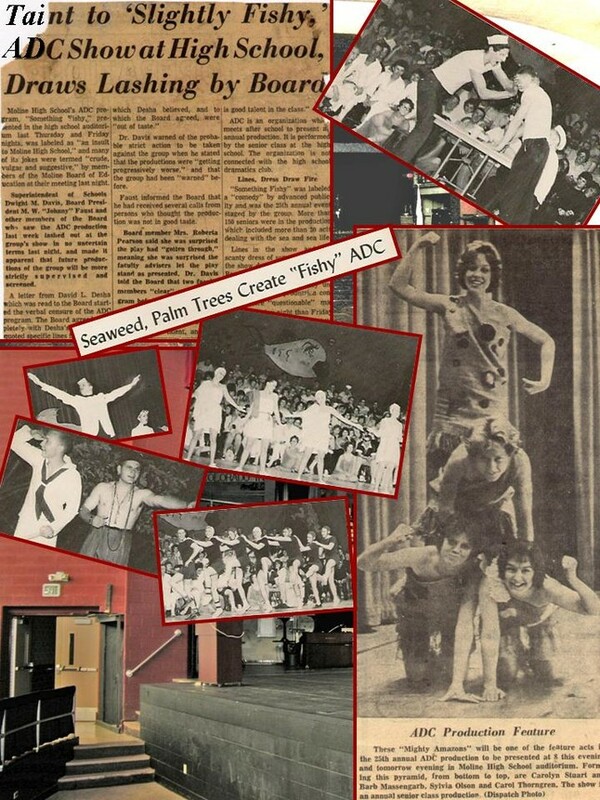 Pep rallies, plays, musicals, and of course ... ADC! Remember the trouble we got into when someone wrote the school board and said it was outrageous? The superintendent said he didn't understand it. We were such a talented class! Yup. We were. And we proved it. Some acts were accused of being "scantily dressed!" Imagine that. Well, that was our tour. There's one more thing to share and that has to do with graduation.